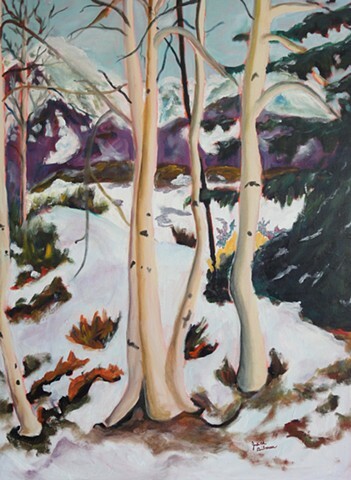 Aspen trunks show their grace during the bare winter months. I love color and I love painting. My greatest hope is that the joy I feel while painting is reflected to the viewer of my interpretive landscapes, cityscapes, and florals. I try to abstract the essence of my subjects by focusing on shapes and playing with color. I began painting in retirement when I was finally able to pursue the interests of my heart. After periods of dabbling in poetry writing and drama, I discovered my love of painting. I dove in, immersing myself in classes and studio time as well as reading and constantly talking about art. My first step in creating a painting is looking for beauty in all types of scenes. I then capture my view of that beauty with the camera. Some of my scenes are discovered locally while others are found on road trips. With a print of the photo in hand for reference, I paint in my small studio. I have enjoyed developing my unique style and learning how the paint "works." Although I feel I still have many steps to take on my journey through art, I am now ready to share my work with others. Please enjoy perusing my albums. All works shown on my site are for sale, although I have not indicated prices here. Contact me through the e-mail link on this page or call my business number, 720-291-1944, for pricing. Payment through Pay Pal or other means can be established once the sale is accepted.